It's been very cold lately...too cold to go out and play with the wonderful present I received from my DH. My Other-Half gave me a wonderful camera! I have been drooling over a Nikon D40x for the longest time...even checking out multiple places online for any "deals" I could find that would fit into my budget. No such luck. Skunked every time. Bah, Humbug! Then, on Christmas Day, said Wonderful Husband gave me presents such as a really nice camera bag that could be placed on a belt, keeping both hands free for using a camera...a second larger bag for keeping the camera, lens, filters, etc. I should have seen it coming, shouldn't I? Then, there it was...the last box. By the time he placed the last present in my lap, I was heady with the scent of a favorite and very expensive perfume he had also given me...this last item was a bit heavier than the others. When I opened it, I couldn't believe my eyes! There was the camera...for one of the few times in my life, I was speechless. Dumbfounded. I can now take all sorts of photos including ones of the sheep in action as this camera has a very rapid recovery between shots. Being raised on 35mm cameras with a father who had a darkroom in many of the places we lived in spoiled me to digital cameras who took their own sweet time to recover after taking a shot, letting good shots get away while I was waiting for it to be ready to go again. So, now I just need a day where I can get outside without dangerous wind chills to start using this Marvelous Toy. Thank you, Honey...for believing in me as well as encouraging me. If I didn't say "Thank you" when I opened the box, it was because I had to wait for the tears to clear from my eyes and my voice to come back. You're wonderful! A few days ago I received this version of "The Night Before Christmas" from our family in New Zealand. I always have to remind myself that, while we are very cold and have snow, the branch of the Family Tree in New Zealand is running around with their shorts on, having barbeque, and enjoying the first part of their spring/summer. I've been to NZ in the early part of December. I always had to remind myself that the Christmas decorations adorning stores and shops was not out-of-place...rather it was me who was backwards on my seasons. Today my family celebrates Christmas Eve...at least the part in New Zealand. 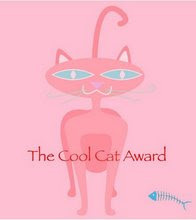 Actually, it's rather nice to have it last two days! Not a possum was stirring, not one could we catch. Jumped out on the deck and let out a shout! With a little old driver and his dog on his knee. Cried "Good on ya, boy! Now GIT IN BEHIND! "Now Flossy! Now Fluffy! Now Shaun and Shane! On, Bossy! On Buffy! On Jason and Wayne! But mind you don't trample the vegetable patch". His eyes-bright as paua shell-oh,how they twinkled! And away they all flew as fast as a missile. I called out "Thanks" as he flew past the gate. He called back: "Kia ora to all … and good on ya mate"
I think Santa has a great idea! He must be using Shetland sheep...our little sheep who can do it all! One of our relatives in New Zealand sent this little video to me. I had not seen it, but understand that it's been out on "The Web" for a while. This is exactly how it was in our bedroom, each morning, before we installed a gate to keep the cats out of the bedroom. Although we had no baseball bats at hand for the wee creatures who allow us to share this house with them, it reminds me of just how it used to be each and every morning. And thank you, Val...for sharing! We do get the odd delta formation of these geese through here in the fall. Nothing like the massive migrations we used to see living in Kansas, or up in the Great Lakes when I was a kid. This was a real treat! Poor things must be saying something like, "Gee, Martha, I thought Arizona was going to be warmer than this. I'm all for heading farther south. How does Mexico sound to you?" 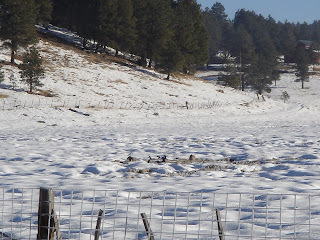 I had walked out into the snow in our pasture to try to get a better photo of our visitors. It was still pretty cold but the sun had come up, starting to warm up the earth again. I stood there watching the birds to see if they would stand up for a better picture. 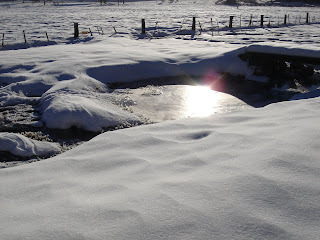 It was then I noticed the other beauty in the morning light...the sound of water still running in the stream, the sunlight bouncing off the snow, turning it into a field of glistening diamonds before my feet. 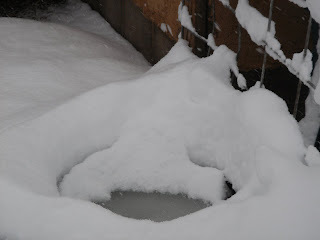 As cold as it was, the stream was still running under the snow and ice. It hadn't frozen up solid. On my way back towards the house I heard a shuffle from the direction of the barn, then silence. There were the small band of sheep I had just put out for their morning meal. They had all stopped eating and were looking at me. In the hush of the morning I thought I heard our wether Colin saying to the others, "Hey, guys! Guys! Mom's got a camera with her...everybody look her way and say, 'Grass'!" There's another storm coming tonight, Guys...better get a move on down towards the south. Last night was a night I rarely have to endure. I was cold and could not get warm. It probably was because I have spent the past five days or so in and out, wet and dry...and not even from doing any Christmas shopping! I could not get warm...no matter what I tried. 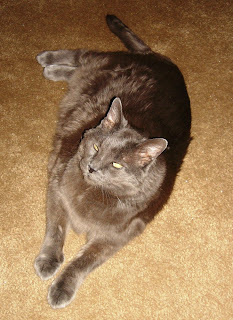 I finally had enough layers for my top parts to warm back into the living, but my legs stayed stiff and cold, and achy. 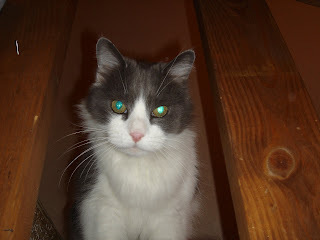 I spied many cat bodies in front of the woodburner. Aha! Thinking that they were almost rendered completely into piles of cat-goo, the same would work for me, I stood by the woodburning stove until I thought my jeans were going to self-ignite, it was so hot. I now know what an ironing board feels like. And that didn't even work! I was afraid to stand there any longer lest I become a pale impression of a human torch. Now, even though they work hard and have kept on going, in truth my barn jeans are just shadows of their former selves. Oh, there's enough material there to cover pieces-parts admirably, but in reality - they are a wisp of their former selves. The sad thing is they are just now getting that lived-in-more-comfortable-than-your-favorite-shoes feel to them. There are times, however, I wonder if it's just sheep suint (from Websters Dictionary: suint: dried perspiration of sheep deposited in the wool and rich in potassium salts) and chicken poo that are holding them together...along with the odd splotch of paint adorning them from our last painting attempt. They have served me well...until now. This morning I remembered my favorite winter undergarments. I had ordered a set of Merino wool, lace-weight, beautiful cream-colored, winter under-garments! They are as soft as Sea Island cotton but can keep you warm even if they get wet, which can be a problem if you are carrying buckets of warm water out to sheep each morning. They have been the best investment I have made with regards to clothing. If I slosh water down my leg I still stay warm. They are lightweight but oh-so warm...truly a godsend for anyone having to be outside with our temperatures. Not to sound bizarre...I mean who really goes around extolling the virtues of knitted under-things? But these will make a difference between still enjoying my sheep, or hurrying through morning chores because I'm freezing. I can keep warm enough to take some time to still enjoy myself. 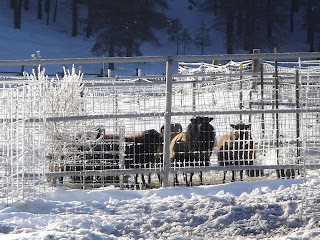 Yes, I still do enjoy being outside with the sheep and around the barn, even in the middle of winter. Shots of the Past Few Days - or - Can I Put My Gloves Back On Now? I thought I would share a few photos from the past five days here at Sheep Thrills Farm, aka "Oleo Acres - One of the Cheaper Spreads". 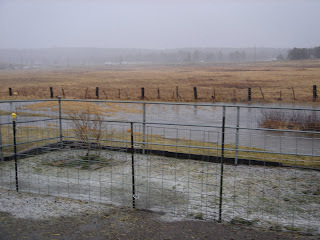 We started off last Friday with very cold rains. 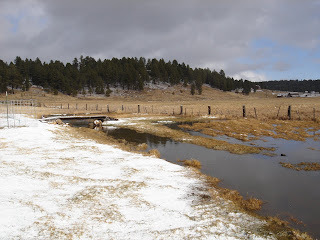 I kept watching the water level rising in the back half of our small pasture. While it was disturbing me, some of the locals found it to be delightful. Silly ducks! 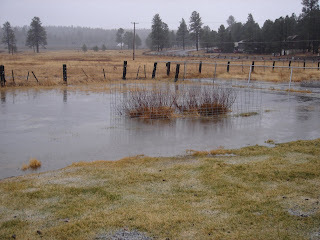 Before we knew it, by Saturday morning our stream had indeed flooded its banks. And it continued to rise. 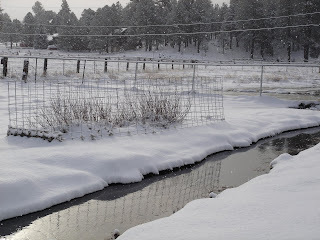 These next couple of photos were taken as the stream was receding from flooding the lower end of our sheep pens near the barn. 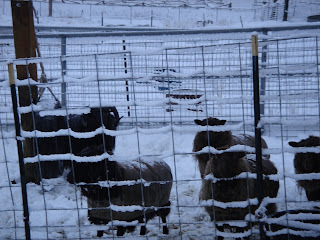 Whether or not they wanted to go in, I made sure all sheep were in the barn on Saturday night. 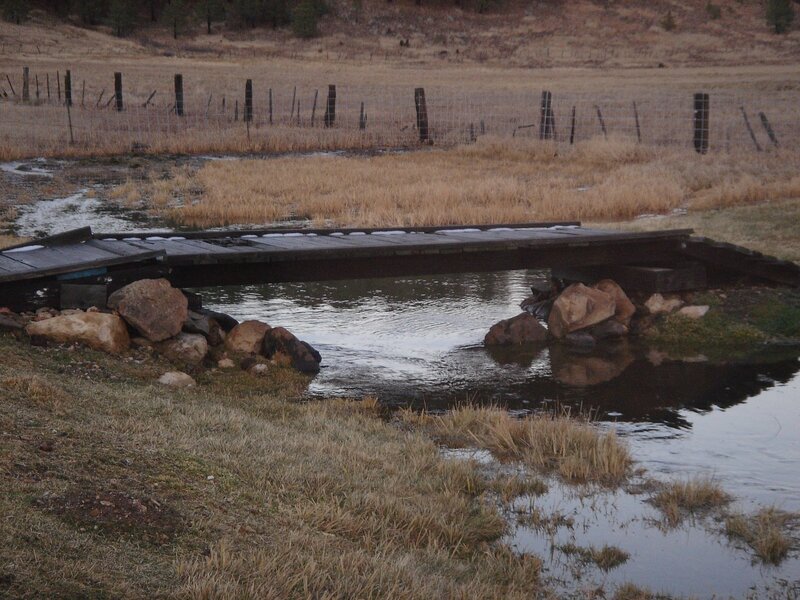 The picture above shows the stream receding, but in the lower right you will see two railroad ties, heavy things that they are, side-by-side. The force of this little bit of flooding was enough to float one of the ties up out of the ground and lay it beside one further down. I was glad to see this was all it had done, as a few years ago, I had to don waders and use a lasso to capture ALL of the RR ties with major flooding we had at that time. 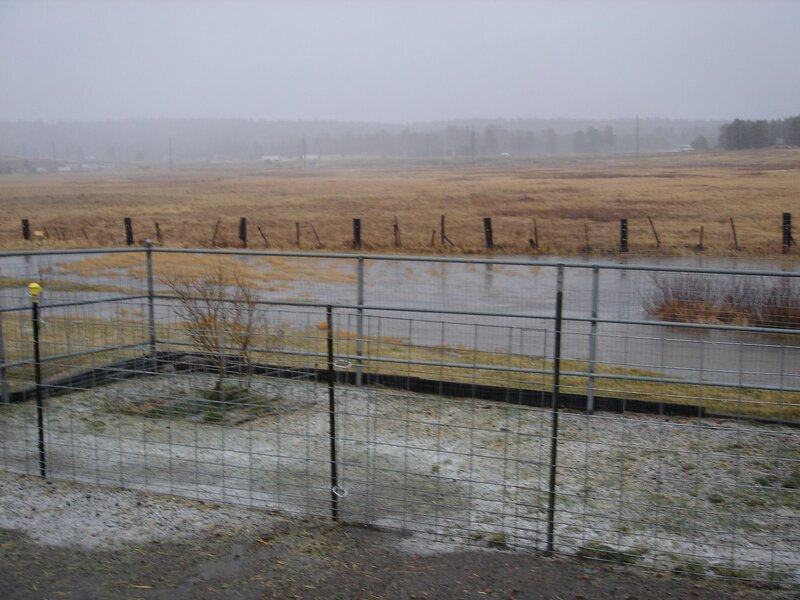 The only problem, other than our dwindling hay amount as stated in the previsou post, was that the rain was so very cold. Shetland sheep are well known for their ability to thrive in adverse conditions, but we had winds driving this cold rain into the fleece of the adult sheep, who were outside at the start of all of this. I took off a glove and checked Skittles fleece deep down next to his skin. The wet hadn't gotten that far, but it was just a matter of time. I mainly did it as a convenience for myself - I really didn't want to be out in this stuff nursing a sick, shivering sheep back to health. Here's a shot of our deck. Tea on the deck anyone? 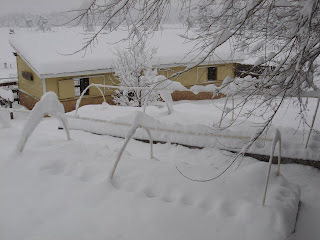 And it looks like I won't be planting any cold season vegetables any time soon. I did turn the sheep out for a while each day. After putting everyone in for the night, I happened to see that Skittles had broken trail over to his (darned) tire-toy, just to make sure it was still there as I had promised him. By yesterday evening the sun had started to try and make an appearance again. 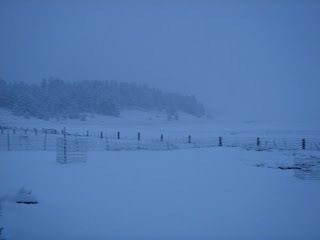 This last photo was about 4:30 p.m., MST. You can see we're in the shadow of the mountain, chilling down rapidly, but across the field behind us and the Interstate, rays of the sun made it through. 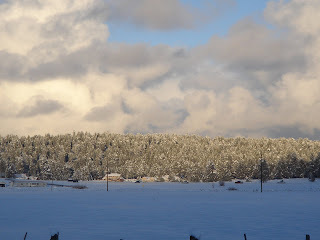 This morning looked as if we were going to get another 24 inches of snow. I decided at 7:30 a.m. I would have a cup of coffee before going out to the barn. 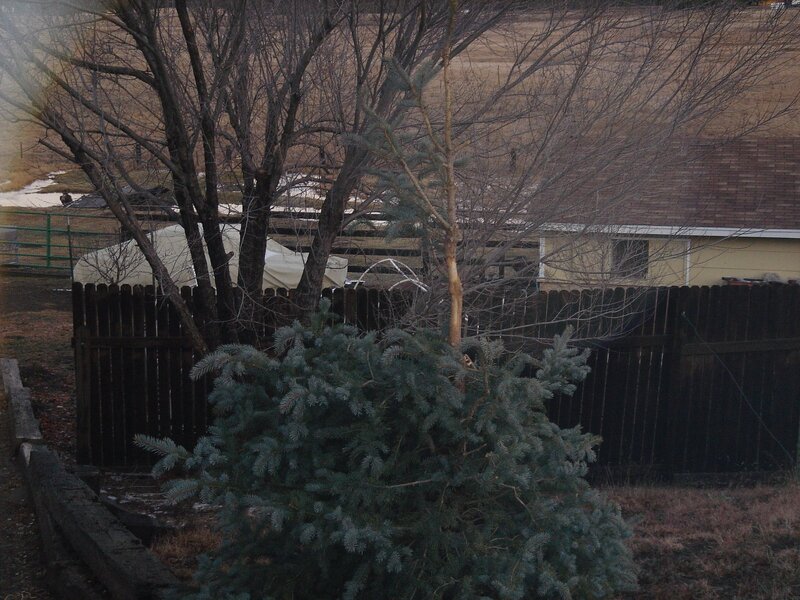 The Weather Channel on TV said we were at 2 F, but I know darned well we were below 0F here. I noticed on the Sheep-O-Vision that the sheep were still sleeping or calmly chewing their cuds. Everyone was fine. Except me...I knew I was going to have to put on layers and layers of clothing to brave the cold to feed and water everyone. 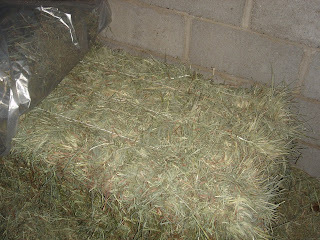 ...but my wonderful, dear Hubby brought me a bale of hay today! Hay, you say? Yes...bless his lil 'ol heart - HAY! 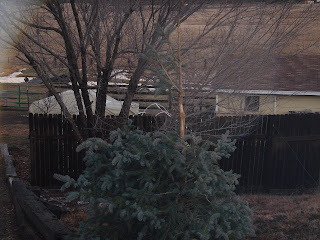 This past weekend we had terrible winds and blowing rain. I didn't want to even chance on trying to pick up a few bales from the feed store and get them home, unloaded and stacked in the feed room in the barn without getting them soaking wet. Our original forecast was for the freezing rains/sleet/snow to end by Monday morning, so I thought I would wait until today to go into town with the truck. Wrong! 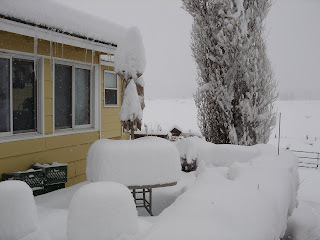 We woke up with four more inches of snow on top of the six compacted layers of snow we had yesterday. When I checked The Weather Channel, I saw a Winter Storm Watch for our area. OK, so it's a "watch" and not a "warning"...maybe later in the day it'll be good enough to go into town, switch vehicles and get the hay. When I sat down to have lunch I thought this plan would work. 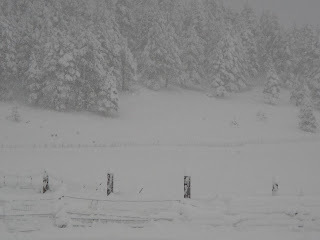 Well, no sooner than I had finished my lunch when our momentary sunny skies turned slowly to white-out conditions. 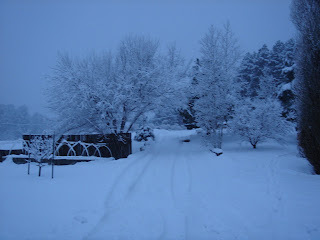 First the sun disappeared, then the soft snowfall became much more opaque in nature. Now I feel I can make it through the storm comfortably. My sheep will eat well and not be on short hay rations. I do also feed pelleted alfalfa along with a bit of grain this time of year, but a vet we know stated to us once that eating good hay keep these animals warmer and more comfortable than all the concentrated rations in the world. Our problem is the hay hasn't been of good quality of late. This is something we have to deal with here in Arizona. Grass hay is shipped in from out of state as most hayfields here are alfalfa. This is something I had to get used to when we first moved here and had our horses. Back where I grew up, alfalfa hay was used for dairy cattle, not horses or sheep. They got good grass hay. I guess here in Arizona land is too expensive for a crop of "just grass". Whoever baled the hay we're getting now waited way too long to cut the hay. I see dead grasses when I open bales, not the good green I should be seeing. 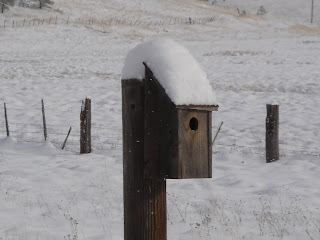 When I went back out to the barn to get animals in and fed I had to laugh. There was Skittles, standing next to his tire-toy, guarding it, looking at me as if to plead that I save it from the snow - which might make it melt and therefore be gone. I had to actually tell him it would be OK to leave it there overnight. The girls knew better. They had seen me bring the hay in. Now they just wanted out of the weather and into the barn...but only IF a meal is served! Random thought for the day: Why is it we drive on Parkways, but park on driveways? I woke up this morning to rain and high winds, plus it was so dark I thought my DH had left early and the alarm hadn't gone off. Not so. It was dark due to the weather. By the time I got dressed, had that all-important first coffee in the morning, and headed out to the barn the rain was coming in sideways. I wondered how Skittles and the girls were fairing outside in their loafing shed. When I got to the barn area, I found the girls to be in the loafing shed quietly chewing their cuds and gazing up at me as if to say, "What's wrong with you this morning?" Skittles was at his tire, guarding it as if the wind were going to blow it away. 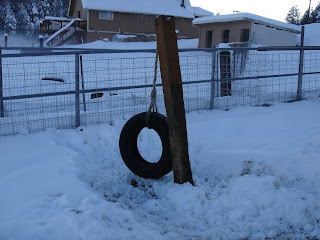 With all the rain, the now soft ground gave the post and tire a definite lean. Note to self: Next spring remove said "marvelous toy", use concrete around the base when properly righted and let concrete cure well before letting him have at it again. I felt of his fleece and noted that the wind had driven the rain very close to his skin. I didn't want him to chill, so I moved the young sheep to the end area of the barn by the chickens and put Skit and the Girls into the end of the barn we use for lambing jugs. I kept one of the barn shutters open for good ventilation, gave them hay and their grain, and made sure I turned on the camera to watch them. This will give his fleece a chance to dry out a bit before all this wet turns to snow this afternoon. 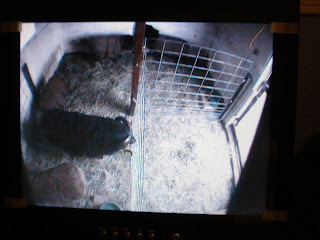 As I write this blog entry, I am watching Skit herding the girls from one end of the pen to the other, stopping to single out Ailee as I believe she may not have settled yet and is coming into season. But it's the driving wind with rain that can stress a sheep. Wool will still insulate when it's wet, but why stress the animal when I can let them get in to dry a bit while we wait for the 40 mph winds to die down? 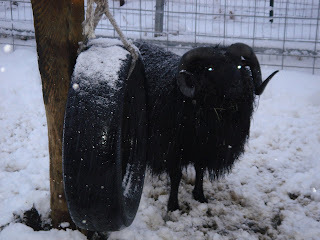 Of course, most other rams are not obsessed with tire-toys. They'd be in the dry, wind free loafing shed with the others. Ziggy's got the best idea...a nice warm fire, some meditation, and a snack every now and then. Move over, Zig. Let me warm up here by the fire with you. Gee, Zig, did you ever think of getting a job as a pillow? 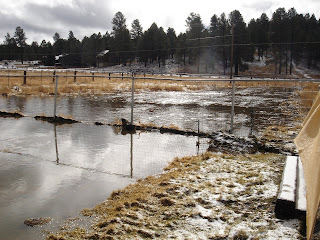 UPDATE: As of 4:50 pm, MST, we have had to put all sheep in the barn as flooding of our stream has come up to the bottom of the pens near the barn. With the help of my DH, we were able to get "The Chicken Side" ready for sheep. Half of this area is sheep quarters anyway, but we needed to remove some feeders to make room for the larger sheep. DH tried to get the camera working on that end, but to no avail. Something best suited for a nice dry day instead. We are in both a Flood Warning and Wind Advisory for the early evening hours. I will try to post again tomorrow with pictures. 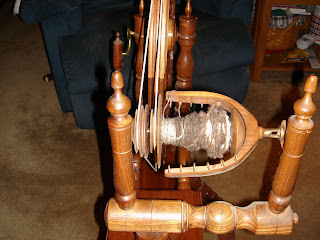 In these pictures, you can see that the drive band runs in two grooves in the flyer assembly, one in the groove on the bobbin where you spin, the other on separate whorls. 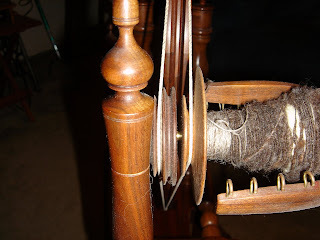 The difference between the two placements actually creates the twist in the spinning and a brake system of sorts to control just how fast the spun yarn winds on to the bobbin. These photos are to illustrate to Tammy a few items we were talking about over the phone. 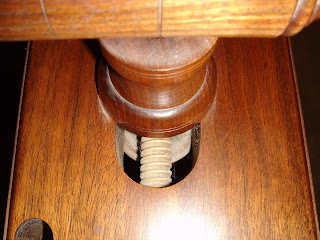 This last picture is of the Table of this wheel and the wooden screw which adjusts its tensioning. This Tension Screw actually is adjusted at the very front of the wheel. Some wheels have a wooden nut underneath the flyer assembly (Mother of All) which have to be loosened to be able to turn the tension screw, others just have this screw. The Table is the main body of the wheel upon which uprights for the wheel, and the flyer assembly, sit. The driveband is a belt that transfers power from the turning wheel over to the whorls and flyer to power the twist when you spin. 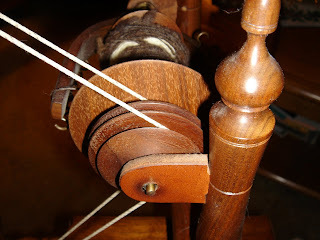 After all, a spinning wheel is a wooden machine. So, there you have it....a post that's really an email hoping it will help a fellow spinner get better acquainted with her "new" wheel. I got excited when Tammy asked if anyone could help her with the driveband. If I had only been close enough, we could have had her wheel up and running in about five minutes. Thank Heavens for phones and computers - when they work right and messages don't go off into oblivion. Don't ever let anyone try to fool you by saying that Arizona doesn't get any rain. As the above photograph of the lower portion of our inner paddock area shows, we were what a racetrack might call "sloppy" this past Saturday. The small pen you see is for the young ram lambs who were wethered about a month ago. They were not Happy Campers when I left them in the barn Saturday. Nor would they listen when I told them it was for their own good. We have come to view storms like the one we just had much in the same way people living along the Nile view its flooding...with mixed blessings. Living on one of the few places in Arizona to actually have a stream flowing through a pasture, we have to visualize these periods of wet as a replenishment sorely needed by all manner of plant life here. Maybe I should amend that statement to include bird and animal life as well. 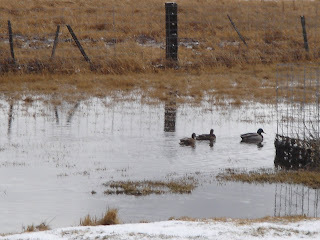 Ducks returned to the stream and open areas both on our property and our neighbor's. I really enjoy listening to them "laugh" in the mornings. I, myself, have to chuckle - it almost sounds as if they are auditioning for the duck in Groucho Marx's old TV show. I wonder if any of them has a mustache and cigar as I make my way from the house to the barn. This old bridge is in desperate need of replacement. I keep reminding my DH it is dangerous to cross now, unless you're walking along the point where the beams underneath support you. 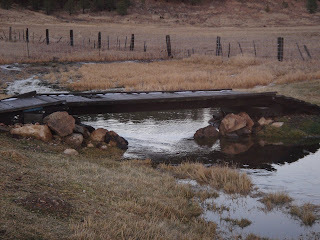 The ram lambs love the creek and the bridge. All throughout the day they play their version of Billy Goat's Gruff, or vie for the position of "troll" by knocking each other senseless, one starting out on either side of the creek and meeting in the middle. It gives me a headache to watch them. Each time they "clunk" together resounds in the air. You can almost feel the ground reverberate sound transformed into mini-quakes. 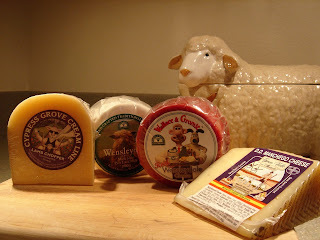 The muscles in my shoulders are sore in empathy for their little necks and foreheads making me glad not to be a sheep.